CHALKING it up to one unique opportunity. Every so often, I'm caught off guard by unique opportunities that present themselves because of blogging. 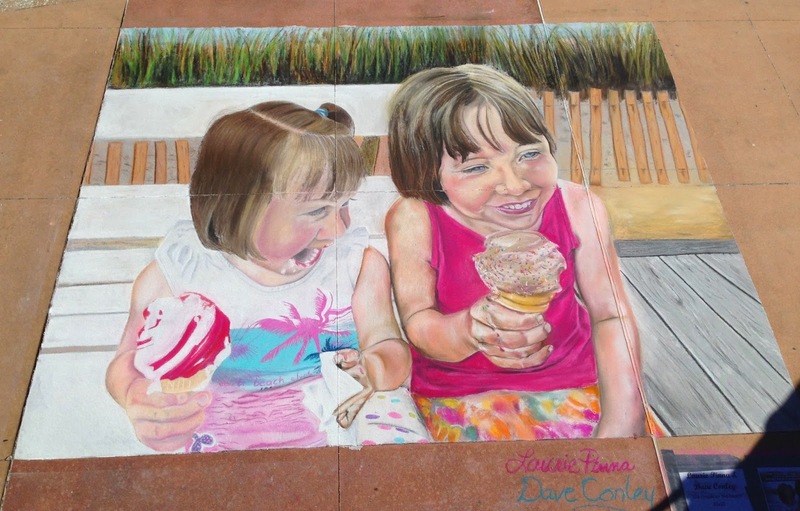 This was the case when I received a message earlier this month from Laurie Pinna and Dave Conley, two Florida-based chalk artists. 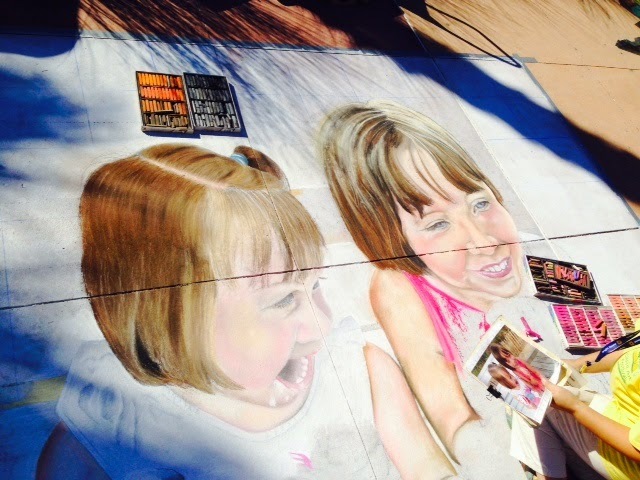 They had discovered a photo of my daughters eating ice cream in a 2011 blog post and hoped to recreate the picture for their entry in the Clearwater Beach Chalk Festival. 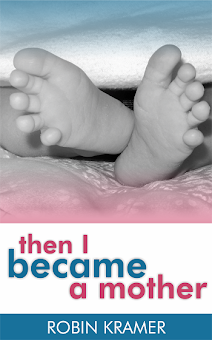 When they asked if we'd grant them permission to use the image, we agreed happily. After all, I am the woman who once wrote a brief dissertation about chalk revealing that I periodically brainstorm other potential occupations besides writing and teaching college students: among them, being the person who transcribes the daily specials on the chalkboard in restaurants. 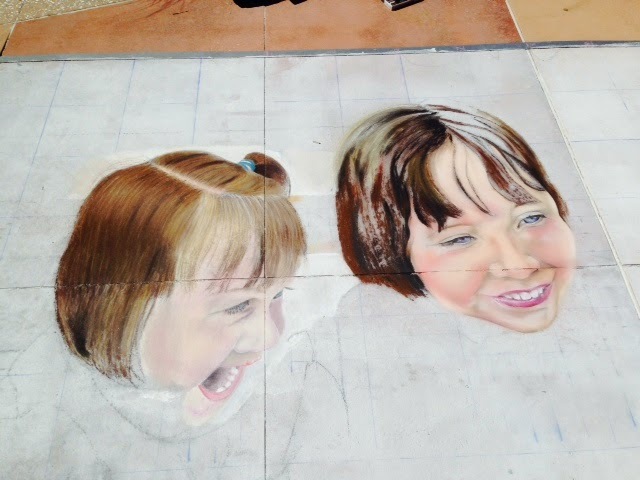 You see, chalk not only influences my career aspirations, but thanks to the artistic talent of Laurie and Dave, it also has captured a lifelike representation of my two oldest daughters on a 12' by 12' square of pavement over one thousand miles away from home. The contest took place this past weekend, and each evening Laurie emailed updates on their progress. 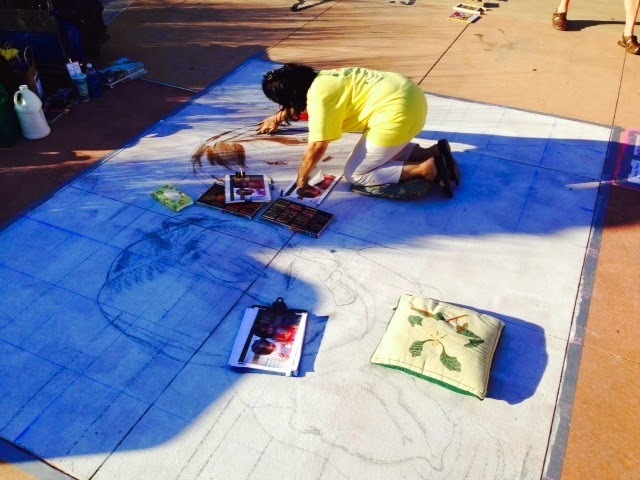 At the onset of the first morning, they primed the area with a base coat of Tempra paint, which essentially is liquid chalk, and then establish a grid pattern to keep the image in proper proportion. Kind of like what I did with my chalked artwork above, which clearly demonstrates lifelike details and realistic scale. Clearly. 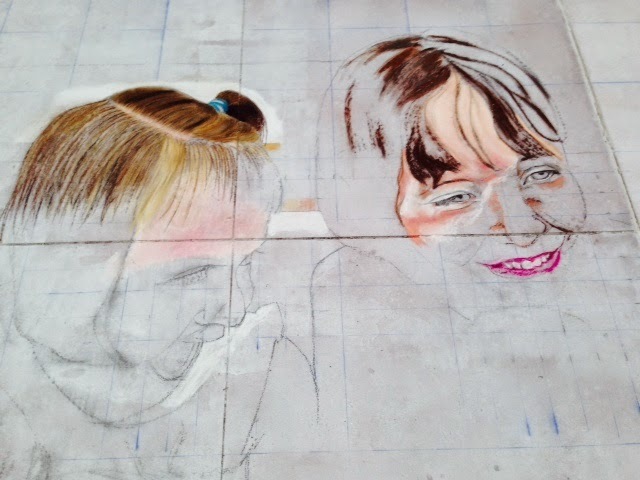 By the end of the first day, the images were sketched and the shading had begun. Converse to the Sistene Chapel where Michelangelo painted while lying on his back, chalk artists work while on their hands and knees, often in the shadow of passers-by who pause to talk with the artists about the subject and the process. During the third and final day, Laurie and Dave refined details and made touch-ups before rising to their feet, stretching, and basking in a job well done. Granted, I'm a biased observer due to my deep love for the subject matter, but isn't their work remarkable? Although I'm separated from the beach by many months and miles, Laurie and Dave's artwork provides a window of remembrance into those carefree days of a summer vacation since past. And isn't this one of the purposes and joys of art: to transport us to another time or place; to leave us not only with an image, but also with a feeling? I can't thank Laurie and Dave enough for sharing their talent and inviting us to be a part of their experience, and I applaud their efforts and all the artists who demonstrated their creative work during the festival. 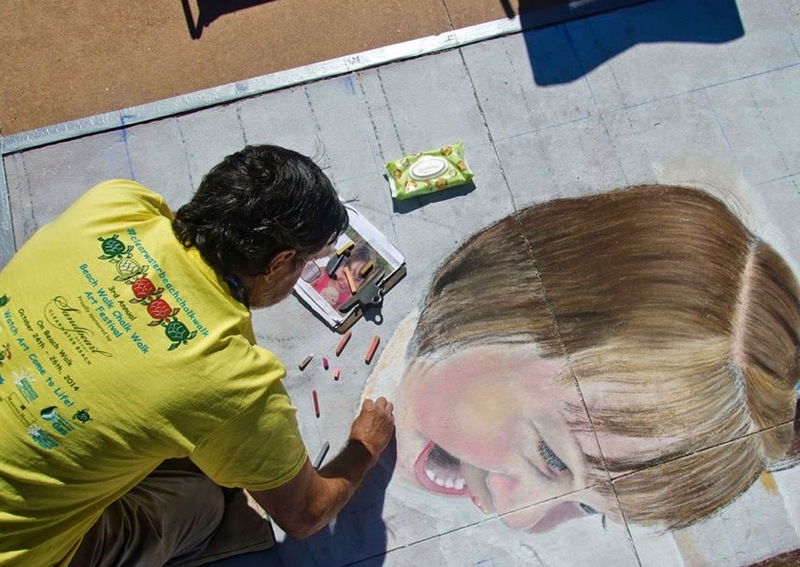 Click here to view more pictures from this weekend's Clearwater Beach Chalk Festival or check out the website for the Florida Chalk Artists Association. Chalk on!